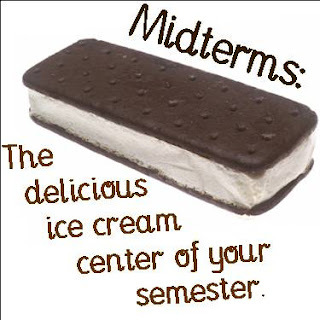 The New Social Worker Online Blog: No More Mid-terms! AS I HANDED IN MY MID-TERM EXAM today, I realized that I won't have another MSW mid-term ever again. I don't mind the papers, but the tests can be so stressful! Our exam today included some stuff we hadn't really studied; stuff the prof said "we should know by now." I'm sure she has a valid point, but during these incredibly busy and stressful times, we weren't prepared for it. I am not upset about it; I did the best I could, and so did everyone else, I'm sure. I told the prof that I hope she grades on the curve! She told us not to worry; she said she was sure we all did fine. And, she also said that she takes many things in consideration for our final grades. I have had her before, and it's true--she does. I will probably get nostalgic about these days of mid-terms, papers, classes, and internships. Just not today. Right now I feel relieved to be at the half-way point of my final semester.